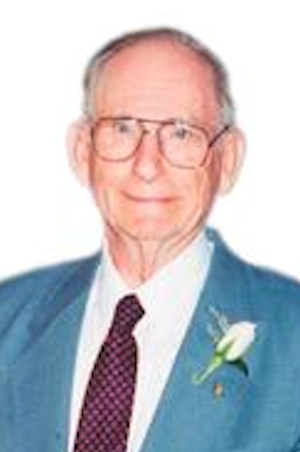 Obituary – Harris, Grant C. « Perry High School Alumni Association, Inc.
Obituary – Harris, Grant C.
The funeral services for Grant C. Harris II, 85 year-old former Enid resident will be Saturday, February 12, 2011 at 1:30PM in the Central Christian Church. The Rev. John McLemore will officiate. Burial will follow in Good Hope cemetery, Helena, OK. under the direction of Henninger-Hinson Funeral Home. Grant was born in Enid at 605 North 10 on September 5, 1925 to Grant C. Harris Senior and Armene (Butts ) Harris and died on February 7, 2011. At age four he moved to Perry, Oklahoma with his parents and attended Perry schools. When he was 14 he moved to Enid where he graduated from Enid High School in 1943. In September 1943 he enlisted in the U.S. Marine Corps and served in the Pacific Theater. He participated in the Battle of Okinawa. He attended Enid Business College after an honorable discharge from the Marine Corps. He was in the insurance business for 35 years, retiring in 1985. He was a charter member of Christ United Methodist Church where he served as Lay Leader, Chairman of the Board, Chairman of Trustees, Sunday School Superintendent, and was a Chairman of Evangelism Committee. He joined Central Christian Church and served as Elder, World Outreach Chairman, President of Sooner Sunday School Class and served on Reach Out Callers Committee. He leaves four children, Mary Virginia Haeberlen, of The Woodlands, Texas, Barbara Fuller, of Oklahoma City, Grant C. Harris III, of Arlington, Texas, and Kenneth Paul Harris, of Oklahoma City. Two sisters, Francis Kehnemund, of Enid and Marilou Redditt, of Houston, Texas. 8 grandchildren, Christine Kirby, Kimberly Haeberlen, Ryan Fuller, Scott Fuller, Sara Beth Miller, Brandon Harris, Nathaniel Harris, and Alicia Woodring. Also 9 great-grandchildren. He was preceded in death by his father Grant C. Harris , Senior, his Mother Armene C. Harris, and his wife Mary Alice in 1997. The family would like to thank the kind and caring staff of both Good Shepherd Hospice and Grace Living Center of Brookwood.